This is a weekly ritual for me, the Friday edition is always full of up to date fashion and beauty articles. The '20 Minuten' is written in German and is very popular amongst expats as it helps with our German language. After picking up a copy in December I noticed an advert for Sal Y Limon jewellery. My mum was over for a visit, so we figured the next day we'd go into Globus for a look (while in the city for some shopping). This is the bracelet I came home with. I also bought another one in a different colour for a friend of mine. They come in 4 widths and more choice of colours then I can recall. With such a wide range of Sal Y Limon jewellery available in Globus, it's hard to choose which one to have!! 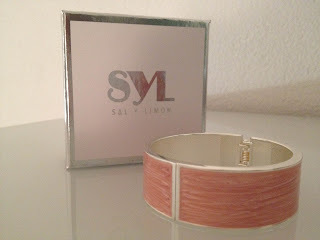 I love Sal Y Limon, the style of those bracelets is so pretty!